KeyForge: Call of the Archons - New Addition! KeyForge: Call of the Archons is the world’s first Unique Deck Game. Every single Archon Deck that you'll use to play is truly unique and one-of-a kind, with its own Archon and its own mixture of cards in the deck. If you pick up an Archon Deck, you know that you're the only person in existence with access to this exact deck and its distinct combination of cards. In fact, in just the first set of KeyForge, Call of the Archons, there are more than 104,000,000,000,000,000,000,000,000 possible decks! 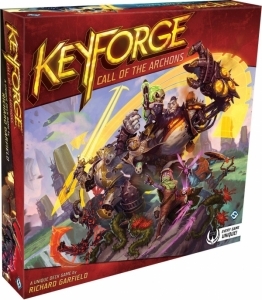 KeyForge: Call of the Archons is played over a series of turns where you, as the Archon leading your company, will use the creatures, technology, artifacts, and skills of a chosen House to reap precious Æmber, hold off your enemy’s forces, and forge enough keys to unlock the Crucible’s Vaults. You begin your turn by declaring one of the three Houses within your deck, and for the remainder of the turn you may only play and use cards from that House. For example, if you take on the role of the Archon Radiant Argus the Supreme, you will find cards from Logos, Sanctum, and Untamed in your deck, but if you declare "Sanctum" at the start of your turn, you may only use actions, artifacts, creatures, and upgrades from Sanctum. 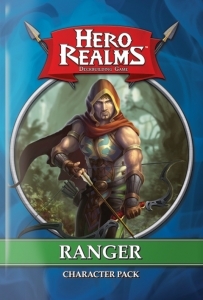 Your allies from Logos and Untamed must wait. Next, you must strive to gain the advantage with a series of tactical decisions, leveraging both the cards in your hand and those in play to race ahead of your opponent. If you wish to weaken your rival’s forces, you may send out your allies to fight enemies on the opposing side, matching strength against strength. Otherwise, you may choose to use your followers to reap, adding more Æmber to your pool. Notably, no card in KeyForge has a cost—choosing a House at the start of a turn allows you to play and use any number of cards from that House for free, leading turns to fly by with a wave of activity! Yet balance is key. If you simply reap more Æmber at every opportunity, your rival may quickly grow their team of minions and destroy yours, outpacing your collection and leaving your field barren. But if you focus on the thrill of the fight alone and neglect the collection of Æmber, you won't move any closer to your goal! If you succeed in finding a harmony within your team and have six Æmber at the start of your turn, you'll forge a key and move one step closer to victory. The first to forge three keys wins! The latest Hero Pack for Teenage Mutant Ninja Turtles: Shadows of the Past is here! 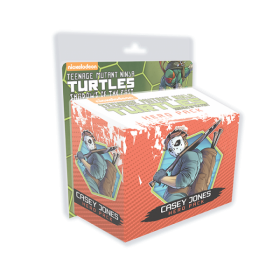 This Hero Pack allows you to use Casey Jones as a playable Hero in any base game scenario and also contains an additional Adventure Comic with four new missions! Teenage Mutant Ninja Turtles: Shadows of the Past is a miniatures combat, scenario-driven campaign game that features story content from the IDW TMNT comic. Taking the role of their favorite Turtle or the ultimate villain Shredder, players battle their way through a series of 60-90 minute missions in which they develop their characters' strengths, fighting styles, and equipment along the way to create a lasting story arc. 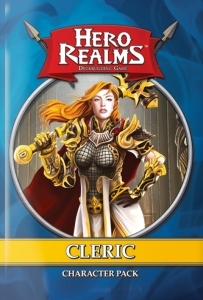 Play Hero Realms as a Cleric! Character Packs add a cool new dimension to player vs player games. Each match-up is a unique challenge which will require different strategies. When playing a cooperative campaign, your Character Pack represents the starting point for your character that you will customize over time.